Dhaka, 18 May, Abnews: Prime Minister Sheikh Hasina has called on leaders and workers of Awami League to strengthen the party being united with the ideals of Bangabandhu. She also urged party workers to always remain beside the people and mould public opinion in favour of the party to achieve success. The prime minister was talking to leaders of Awami League and its associate bodies who went to her Gonobhaban residence to greet her on her home coming day (May 17). On May 17 in 1981, Sheikh Hasina returned home after six years of exile following the country's saddest history of killing of Bangabandhu on August 15, 1975. 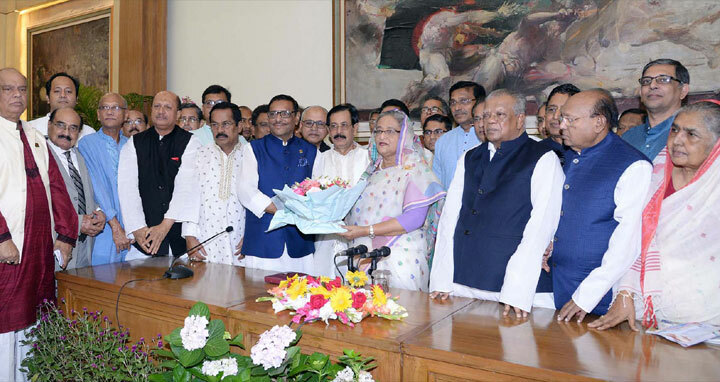 Senior leaders of the party greeted the Prime Minister, also the president of Awami League, by presenting bouquets of flowers. Leaders of different front organizations of the party followed them. "You have to keep in mind that the party can achieve anything if leaders and workers remain united," Sheikh Hasina said. Advisory Council members of Awami League Amir Hossain Amu and Tofail Ahmed, presidium members Matia Chowdhury, Adv. Sahara Khatun, general secretary Obaidul Kader, joint secretaries Mahbubul Alam Hanif and Dr Dipu Moni, among others, were present. While describing ups and downs of her political journey over the last 37 years, Sheikh Hasina became emotional time and again. She also urged the party leaders to choose her successor. Sheikh Hasina said she becomes emotional when she remembers the gathering of millions of people in the airport to receive her braving heavy rain and storm. "Love and affection of the people of Bangladesh inspired me to go ahead," she said adding that as an orphan her political career began in the shelter of the loving people of Bangladesh. Sheikh Hasina said the prime objective of her politics was to return the power to the people from military junta and bring smile on the faces of the masses. Sheikh Hasina said it was a big challenge for her to take the responsibility of the party despite her active role in student politics. The prime minister said she returned home at a very difficult time when the killers of Bangabandhu were enjoying indemnity and full liberty. Self-styled president Ziaur Rahman was running the country under night curfew and trying to split the Awami League. Sheikh Hasina said Ziaur Rahman pushed the county to a situation when 19 coups took place. And, taking the opportunity, Zia killed hundreds of officers in the armed forces, including 562 officers of the air force. "Some officers were on leave and knew nothing about the coup. But, Zia picked them from home and killed them by firing squad," she said. Sheikh Hasina said Ziaur Rahman was killed due to internal conflict in his party. And, after his killing a blue print of killing many army officers was executed. "Twelve young army officers were killed in a farcical trial of Zia killing. Most of them were in dark and their family members saw the news of their death penalty on television screen," the prime minister said. Sheikh Hasina asked the party leaders and workers to provide security for the witnesses of murder trial of Bangabandhu and war criminals in their respective areas. "Any person to be found guilty of harming any witness of the trial of the war criminals would be brought to justice and may face death penalty like war criminals," she reminded.